Demanding to vote, September,2014..Joan Campderrós-i-Canas/Flickr. Some rights reserved.Throughout, the Rajoy government’s response to the massive campaign of protest in Catalonia over the past five years has been legal, not political. This is based on the much-repeated point that any vote on separation by any one part of the country is incompatible with Spain’s 1978 Constitution, and above all Article Two, which declares that the Constitution is based on “the indissoluble unity of the Spanish Nation, the common and indivisible homeland of all Spaniards”. Hence, a Catalan vote is illegal, plain and simple. Beyond that, any political approaches have been very hard to find. This position has enabled Rajoy and his ministers to stand on their dignity as the defenders of the Constitution and the rule of law, “without which there is no democracy”. In this they have generally been supported by large sections of Spanish opinion outside Catalonia, including the overwhelming majority of the non-Catalan media and the official opposition, the Spanish Socialist Party or PSOE, which while using more conciliatory language, at least at leadership level, and proposing a reform of the Constitution, has still insisted that for the meantime any regional independence vote remains unconstitutional. Until recently it has been widely acknowledged that Spain’s 1978 Constitution was an untidy compromise agreed in the aftermath of the Franco regime. It served its purpose well as the basis for the transition to democracy, but many feel its inadequacies have become ever more apparent and many – including, as said, the PSOE – call for it to be substantially reformed. In the context of the Catalan dispute, however, for conservative commentators and politicians the 1978 Constitution has acquired the status of holy writ. And in particular the idea of the indivisibility of the Spanish nation, so that decisions on sovereignty can only be taken by the people as a whole. In Britain during the Scottish campaign it was sometimes observed that for the shape of the state to be decided by Scots voting alone was an injustice, that the rest of the UK should have a say in it too, but few pushed it very far; in Spain this has been erected into a sacred principle. Catalonia could only leave Spain, it is declared, if a referendum across the whole of Spain agreed to let it do so, and any local exercise of sovereignty by Catalans would be an aggressive act, an attack on the rights of other Spaniards, a denial of their legitimate interests. For those Catalans who already consider themselves a nation with a right to a sovereign existence and who feel stifled within Spain, of course, to be told that they can only leave in the impossible scenario that the whole of Spain votes to expel them just seems another form of abstract pedantry. Legalism and wrapping oneself in the Constitution has given the Rajoy government a debatable claim to the “moral high ground”, but it has been a political catastrophe. In practical terms, support for Catalan independence has risen relentlessly throughout the time Rajoy has maintained his stonewall approach, from around 15–20% in 2010 to 45 or 50% today. Support for the basic question of local sovereignty, the “right to decide” in an independence vote, is even greater, at about 80%. One of the phrases commonly heard in Barcelona is “I’m not at all sure about independence, but I’m sure we should have the right to vote”. Nationalist politicians state frankly that the government’s “closed door” combined with the bullish, dismissive belligerence of its members has been their greatest asset. Equally importantly, this emphasis on the emotive issues of sovereignty and basic democracy have obstructed discussion of the actual benefits of independence, or much questioning of the pretty utopian prospects presented by Catalanists. The same surveys that show 50% support for independence show, obviously, that half the population remain to be convinced (or are actively opposed). But the current argument has not been framed in a way that helps anyone look dispassionately at the pros and cons. It has allowed Catalanists to convince themselves they have “overwhelming support” when this may well not be the case. Obviously, every constitutional government has a legitimate concern for ensuring the maintenance of law and due process. However, the particularly inflexible interpretation of constitutionalism embraced by Rajoy, the PP and their allies has been questioned on legal grounds, such as when a group of 33 Catalan judges signed a statement in February that in their view the Consulta and the “right to decide” were compatible with the Constitution (for which they were immediately sanctioned by the judicial authorities). 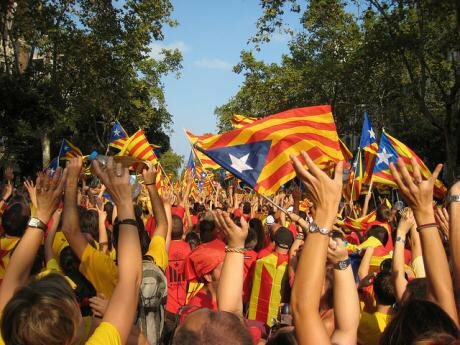 This neo-Jacobin obsession with the single sovereign nation and its rather abstract rights has very evidently been a means of avoiding acknowledgement of thorny political questions, such as the very fact that the Catalanist movement involves hundreds of thousands of people, and is not – as it has frequently been described by government spokesmen and non-Catalan media – just a plan sobiranista or “pro-sovereignty plan”, some sort of plot cooked up between Mas and a few other politicians, leading a deluded flock. Legalism and “hyper-constitutionalism” have also served to obstruct and generally ignore other issues that should surely be given importance in any democratic society. Fundamentally, that of violence. There hasn’t been any. The Catalan campaign has been overwhelmingly, massively, peaceful. Catalan nationalism has never engaged in “the cult of the gun”, as the Irish historian Roy Foster has called it, but rather the opposite, taking pride in its civic, non-violent character. The only, very marginal terrorist groups disbanded 20 years ago, and in the current campaign even vaguely violent incidents have been scarcely noticeable. The upsurge of pro-independence feeling since 2010 has been expressed in massive, peaceful demonstrations on a larger scale than any others in Europe – one million people in Barcelona that year, 1.5 million again in 2012 and in a human chain crossing Catalonia in 2013, around 1.8 million forming a giant V-for-vote across Barcelona on 11 September 2014 – made up of whole families from grandparents to small kids, groups of friends, elderly couples, in an atmosphere that’s a mix of celebratory and determined. These giant “transversal” rallies – cross-generation, cross-party, cross-community – are, as a Catalan historian said to me, something “totally new”. And, as the sage commentator of La Vanguardia Enric Juliana noted this week, Sunday’s vote was the fifth such mass-scale mobilization in Catalonia in four years “without a single broken window”. In a continent where so much misery has been inflicted by inter-ethnic violence you might think this would at the very least be worthy of acknowledgement, and gain some consideration. And yet you’re very unlikely to find it even mentioned as any kind of positive factor in any Spanish media outside Catalonia (and the less so the further right you go). It’s more likely to be dismissed as a deception, or in some rightist outlets even a coartada pacífica, a “peaceful alibi”, a devious smokescreen that has allowed Catalanists to get away with things that should have been nipped in the bud. At an official level, the government and local members of the PP and other anti-nationalist parties claim that the constant pro-vote agitation has created a “fractured society” in Catalonia, in which non-sympathizers and above all Spanish-speakers find their views silenced by a movement that behind its family-outing, smiling image is intolerant of any disagreement. For an outsider this is difficult to judge. Catalanists and Catalanist media often recite their own self-confirming certainties and, like any fired-up, emotional nationalist movement can be smugly dismissive of local opposition. Twitter and other social media are full of the sort of malevolent idiotic abuse between Catalanists and antis found on any subject anywhere in the world, but then, that’s Twitter. Enric Millo of the Catalan PP – who expresses himself far more moderately than is usual in his party – makes the telling point that even if just one person is afraid to express their opinion, “in a democratic society, that should be a cause for reflection”. However, in the end it is a matter of scale: verbal insults, however nasty, do not amount to communal violence. In a quick personal straw poll of Barcelona residents, all found the idea of a “social fracture” a gross exaggeration. Meetings called by Societat Civil, the nearest thing to a local “No” campaign, are not tiny by comparison with Catalanist demonstrations because of nationalist mobs intimidating away potential attenders: the very idea is ludicrous. Meanwhile, outside Catalonia an entirely more apocalyptic picture appears in off-the-record government briefings, right-wing media and non-strictly governmental circles that are still hugely influential in the PP, such as the Fundación FAES think-tank set up by former prime minister José María Aznar. For anyone not familiar with the theatrically belligerent, grandstanding style of the overwhelmingly right-wing pundits on the discussion shows that fill hours of Spanish TV, this can come as a shock. The Catalanists’ peaceful mass campaign and their democratic credentials are shoehorned into a one-size-fits-all horror story of minority nationalism as inherently genocidal, primitive, discriminatory, leading inevitably to pogroms and Srebrenica. This allows non-violent Catalans to be condemned in carelessly violent language. Anchoring themselves in their attachment to the Constitution, talk-show pundits discourse loftily on the unacceptability of “exclusive” minority nationalism and how much it is a throwback compared to their own post-nationalist constitutionalism, with a stunning disregard for any idea that their own position might just also be an expression of an aggressive, “exclusive” Spanish nationalism. José María Aznar, who with the aid of the Fundación FAES is still highly influential in the PP in pressing for hard-line policies, has claimed that “identity-based nationalism” sought to “finish with democracy”. In July a manifesto was presented in Madrid titled Libres e Iguales (“Free and Equal”), signed by a range of intellectuals and others including Nobel prizewinner and joint Spanish-Peruvian citizen Mario Vargas Llosa, declaring their devotion to the Constitution, and calling on the government to reject any negotiation with “Catalan secessionism” and “enforce the law in full” against anyone who violated it. Presumably on the strength of its celebrity signatures, on 8 October they managed to place a ferocious op-ed piece in the New York Times titled A Threat to Spanish Democracy, co-signed by Vargas Llosa, Catalan writer Nuria Amat and chief Libres e Iguales spokesperson Cayetana Álvarez de Toledo, denouncing the vote as an attempt to destroy democracy for the sake of a nationalism that “effaces the individual… divides and discriminates… and defies the essence of democracy: respect for diversity”. Libres e Iguales have among their slogans “For Peaceful Coexistence and Civil Peace”. Asked in what way the Catalanist movement had actually violated the peace, Álvarez de Toledo, an Oxford-educated aristocrat who is also a PP deputy for Madrid and director of the FAES, said that this referred to the fact that the 1978 Constitution was the guarantee of “civil peace” for all Spaniards, so that any attack upon it was automatically an attack upon peace, not any specific acts of violence. She went on to add that all nationalisms represent a “passionate, dishonest, atavistic discourse” that inherently “seeks the expulsion of anyone different”, and that it was “a lie” to suggest there was any difference between them, so the question of specific violence was irrelevant. In other words, Catalanists are guilty by definition, whatever they actually do. In August Vargas Llosa gave an interview to the conservative Madrid paper ABC in which he said, comparing the Catalan movement with nationalists who “kill and plant bombs”, that “I would say that the nationalism that presents itself as something peaceful, legal and democratic is more dangerous”, leaving in the air the remarkable suggestion that the eminent novelist somehow found the former preferable. Alongside all this is the now-routine allegation of an equivalence between Catalanism and Nazism, taken to a level jaw-dropping to outsiders. A few weeks ago the Catalan Assembly, one of the civil-society organizations that maintains the pro-independence campaign, and which finances itself through sales of its ubiquitous red and yellow t-shirts and other things, announced a “Friendly Trader” scheme, giving out window stickers to sympathetic shops that stocked its merchandise. In the anti-Catalanist media this was immediately taken up as a means of boycotting shops that did not have stickers and so were not nationalist, and a columnist in ABC produced a piece titled “The Star of David in Catalonia”. Now, maybe in some places not having a sticker might lead to some people passing you by, but to go from there to the Kristallnacht has to be a crass disregard for what Nazism actually meant. A reality check is needed here. Newspapers like ABC and La Razón, populist TV channels, figures associated with the FAES and groups like Libres e Iguales have all been the most vociferous in demanding the government take determined action against the Catalan campaign. After the 9-N vote, Libres e Iguales condemned the Rajoy government for failing to “enforce the law” by preventing it from taking place, and Cayetana Álvarez de Toledo was the first PP deputy to condemn Rajoy openly for his “abandonment” of his duties and call for his resignation. Exactly what they want is hard to pin down, given the frivolity of much of their aggressive rhetoric, but at the least it implies large-scale arrests, the prevention of voting, immediate repression of demonstrations. In other words, the very people who wrap themselves in “liberal constitutionalism” are the ones who demand the introduction of the use of force in a situation that has so far been entirely peaceful. As the stand-off goes on, both sides look to Europe for support. The Catalans on the basis of democratic principle and their record of peaceful campaigning. Rajoy looks for backing from the Eurozone, and above all Germany, as a defender of stability. It would be interesting to know if anyone at any European gathering has the nerve to ask Prime Minister Rajoy whether he and his government might be causes of instability themselves, and if they have any kind of Plan B. And perhaps the NYT might get back Mario Vargas Llosa and ask the eminent author to clarify just why he thinks peaceful protest is “more dangerous” than guns and bombs. It can only be demeaning to the Nobel Prize to have this kind of argument put around without explanation.